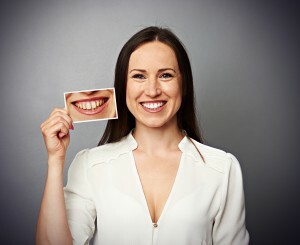 The most effective methods of teeth whitening occurs in the dentist’s office. This in-office procedure is quick, with immediate results. Please see our office about pricing and current specials. Teeth are first polished with pumice, and then gauze is placed in the mouth to keep teeth dry during the procedure. Teeth are then coated with a whitening solution composed of either hydrogen peroxide or carbamide peroxide. Several methods utilize a curing light or laser to heat the solution. Although very popular, this home whitening method does not provide the immediate results of an in-office bleaching. These clear trays are typically worn for a couple of hours a day or while you sleep. It usually takes about 3 days to a couple of weeks before any results will be noticeable. For the best results speak to your dentist about whitening kits that can be purchased through them. The over-the-counter kits are not as effective. Whitening strips and whitening toothpastes can be purchased over the counter. While these can provide whitening results, our whitening treatments are much more effective.